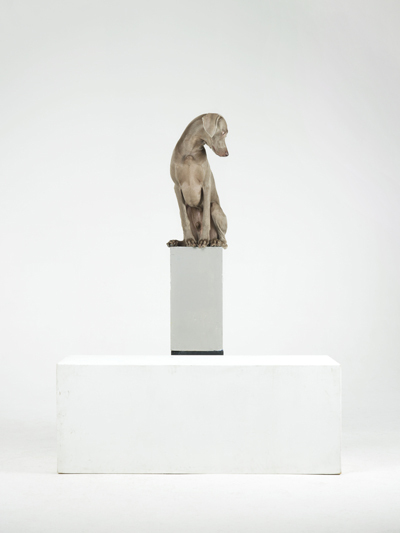 Senior & Shopmaker is pleased to announce William Wegman: Cubism and Other –isms, an exhibition of recent photographs in which the artist, with his trademark wry humor, mines art historical precedents to create images of startling beauty. 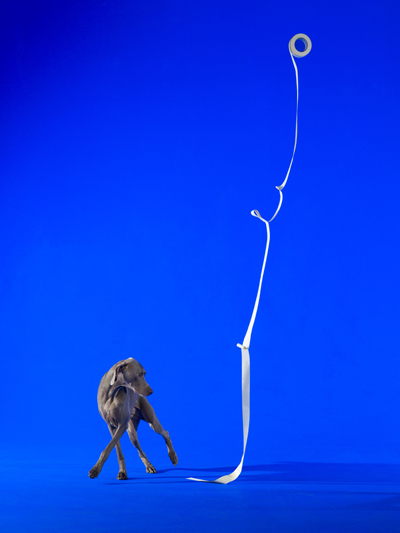 Beginning in the early ‘90s while making videos and films with his dogs standing in as human characters, the artist placed his subjects on elevated platforms in order to shoot them at eye level. Over the years, props in Wegman’s photographs have taken many forms, but none so consistently as the cube, which in Joan Simon’s catalogue essay for the artist’s 2006 retrospective, Funney/Strange, represents “ an art-about-art reference echoing both the pedestal of traditional sculpture and the Euclidean geometry of Minimalism.” The cube is also one of the most available on-set items in the studios of commercial photographers, used for displaying products in tableaux or isolation to highlight their form or shape. 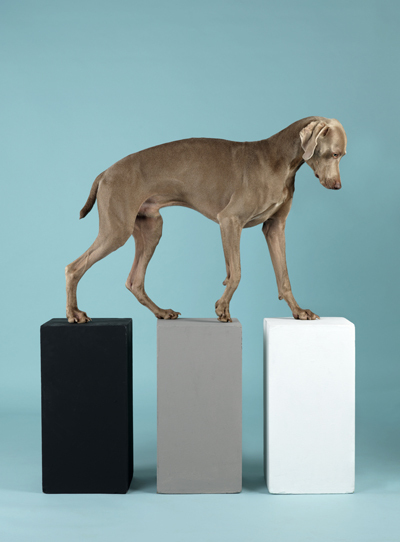 In Constructivism and A Step Up, Wegman exploits his dogs’ lithe athleticism, posing them in precarious relationship to props configured to suggest the Suprematist compositions of Kazimir Malevich and Vladimir Tatlin’s Constructivist “tower”. In this new body of work, Wegman employs another tool borrowed from commercial photography, but for his own specific and utterly straightforward ends. ChromaKey is the process of shooting against a blue or green screen, removing that screen color with special software, and adding in a more exotic background. Wegman, however, forgoes Photoshop or other image manipulation, letting the high intensity backdrops serve as a foil for natural (canine) skin tones. In pieces such as Cursive Display and Blocked, the Weimaraner is posed against a seamless backdrop of vivid blue or red against which his beautifully lit subjects and props stand out in stark relief. 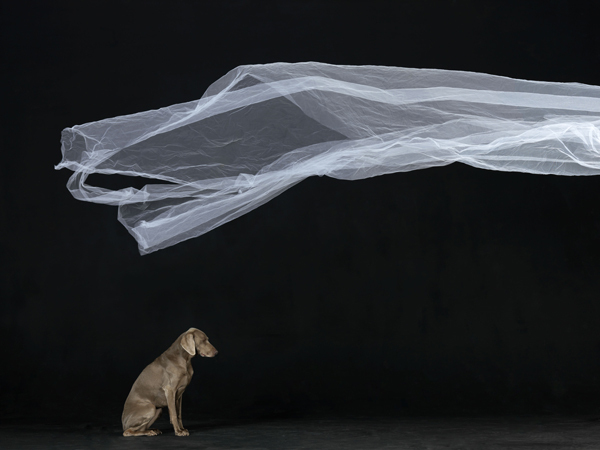 William Wegman’s photographs, video works, paintings, and drawings have been exhibited in museums and galleries internationally. Recent exhibitions include William Wegman: Hello Nature, a major survey organized by the Bowdoin College Museum of Art of over 100 nature-related works by the artist in various media (2012), which traveled to Artipelag, Värmdö, Stockholm, Sweden (2013); and A World of Its Own: Photographic Practices in the Studio, a group exhibition organized by the Museum of Modern Art, New York, (2014). In January 2015, the Krannert Art Museum, University of Illinois at Urbana-Champaign, Illinois will present Artists Including Me, a one-person exhibition of the artist’s paintings and drawings. Wegman presented the annual 2014 Robert Rosenblum lecture at the Guggenheim Museum of Art, New York. Gallery hours: Tuesday – Friday, 10am-6pm; Saturday, 11am-6pm. For further information, please contact Betsy Senior or Laurence Shopmaker at 212-213-6767 or at gallery@seniorandshopmaker.com. © 2018 All rights reserved. Senior & Shopmaker Gallery, Inc.